Of the 370 new civil services recruits trained at the Lal Bahadur Shastri National Academy of Administration (LBNSAA) in Mussoorie, eight took the Civil Service Examination (CSE) in Hindi compared to 48 of 202 in 2013; five recruits studied at Hindi-medium universities; and 30 attended Hindi-medium schools. 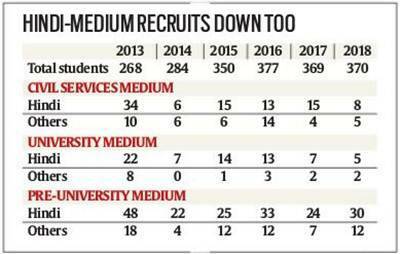 Data obtained by The Indian Express show that since 2013, there has been a sharp dip not only in students taking the CSE in Hindi — for services like the IAS, IPS and Indian Foreign Service — but also in recruits who studied in either Hindi-medium universities or schools. According to the data, there is also a steady increase in students preferring English. An analysis of the profiles of recruits who took the foundation course available on the LBNSAA website shows the decrease: while students took the CSE in Hindi accounted for nearly 17% in 2013, it stood at 2.11% in 2014, 4.28% in 2015, 3.45% in 2016, 4.06% in 2017. And of the 2018 recruits who finished the 15-week foundation course last month, 2.16% took the CSE in Hindi. The sharp fall stems from reforms implemented in the CSE when the UPA government brought in the Civil Services Aptitude Test (CSAT) in 2011. Following a backlash in and outside Parliament, the compulsory CSAT Paper-2, comprising Maths and English comprehension, was made just a qualifying paper with effect from the CSE-2015. In 2013, the pattern of the CSE Mains was also changed. Instead of two optional subjects, only one subject was made optional and General Studies papers were increased from two to four. Experts believe this limited the space for students from Hindi-medium schools and universities. Data show that in 2013, there were 48 — or a quarter — of 202 recruits at LBNSAA, who studied in Hindi-medium schools, 22 (or nearly 11%) studied at Hindi-medium universities and 34 (nearly 17%) took the CSE in the Hindi. Before the CSAT was introduced, the performance of Hindi-medium students was a little better, according to data. Profiles of the LBNSAA recruits for 2008, 2007, 2006 and 2005 show that the representation of students who took the CSE (written) in Hindi was between 12 and 15%. In 2008, for instance, 32 out of 239 students took the CSE in Hindi – over 14%. Incidentally, of the 370 recruits at the foundation course in 2018, 280 have studied Science subjects including Engineering and Technology, Medicine, Pharmacy or pure sciences. Among them, as many as 149 were B.Tech graduates and 75 were B.E graduates. Only 55 were from Arts and Humanities while the remaining were from management and commerce. This follows the trend in 2017 when of 369 recruits, 287 were from Science fields and in 2016, when 280 of 377 had studied science subjects.